Day 1 of the 2010 Fall Tiger Beetle Trip™ had been an unqualified success. Not only did we achieve our top goal of the trip – seeing good numbers of the recently discovered South Dakota population of Cicindela pulchra (beautiful tiger beetle), but we also saw C. nebraskana (prairie long-lipped tiger beetle) and a variety of other interesting insects in the nearby Nebraska Pine Ridge. For Day 2, our destination was Monroe Canyon on the north face of the Pine Ridge escarpment, but on the way there we decided to check out some roadside clay banks in the town of Crawford. Despite their appearance as perfect tiger beetle habitat, all we saw was a single individual of the normally ubiquitous C. purpurea audubonii (Audubon’s tiger beetle). The area looked quite dry, and in fact there was little insect life of any kind present… or so I thought. As I stood there looking out onto the embankment while deciding my next move, I glanced down at a nearby composit shrub with small yellow flowers. These are often attractive to a variety of beetles (Crossidius longhorned beetles would be nice! ), but I saw none. I started to move on, but before I did I noticed some tiny little slivers of life moving about on the flowers. Kneeling down to take a closer look, I saw that they were moths – in fact, they were some of the smallest moths that I had ever seen, and the shrub was covered with them. Now, I may pride myself on my broad-based entomology knowledge, but when it comes to microlepidopterans there is a decided gap in that knowledge. I really had no idea what they might be, but for some reason the combination of their unknown identity and tiny size became for me an irresistible photographic challenge (made truly challenging by the unrelenting prairie wind). I’m fortunate that Chris also became distracted photographing something – any other collecting partner surely would have grown impatient waiting for me to finally be satisfied I’d gotten some good shots. As far as I can tell, these moths represent something in the genus Scythris or perhaps Neoscythris. These are the so-called flower moths, placed either in the family Scythrididae (Microleps.org and Moth Photographers Group) or subfamily Scythridinae of the Xylorictidae (BugGuide.net and Tree of Life). According to Microleps.org, the life histories of relatively few scythridid species have been determined – the few that have showing a preference for feeding (usually internally, e.g., as leaf miners) on members of the Asteraceae. There are images of several species of Scythrididae at the aforementioned sites; however, it’s a large group, and the individuals in these photos don’t appear to match any of the illustrated species. Perhaps Chris Grinter or some other microlepidopterophile will chance upon this post and either confirm or further elucidate the identity of these individuals. This entry was posted in Lepidoptera, Scythrididae and tagged entomology, flower moths, insects, moths, nature, Nebraska, science. Bookmark the permalink. Nice blog Ted! i like the title! Thanks, Art. The title just popped out while I was writing. I had to fiddle with the exposure compensation quite a bit before I was satisfied. I agree, nature’s yellow is tough to deal with! Intriguing, these tiny leps, but I probably know less about them than you, even. Just how small were they, by the way? And, any idea about the identity of the shrub? Hi James – I’d say frons to elytral apex length was 4-5 mm. I’m sure there are smaller moths, but not that I’ve ever noticed. The shrub I first noticed them on was (I think) broom snakeweek (Gutierrezia sarothrae). The second photo was a larger flowered composite. Hi Bridgette – very small, 4-5 mm total length. I probably spent a good 20 minutes or so working on getting photographs of these guys, made very difficult by the wind and their nervous disposition. I’ve probably mounted no more than a couple hundred leps in my entire lifetime, and most of those were sphingids and saturniids (with a few clearwing moths thrown in). I can’t imagine trying to mount and spread something like this – but then, I’m sure most others would shake their heads similarly after looking at the thousands of tiny buprestids, all with their whackers pulled, lined up neatly in my cabinets! Great to see more lep photos Ted! I agree with your ID, this is a Scythrididae. 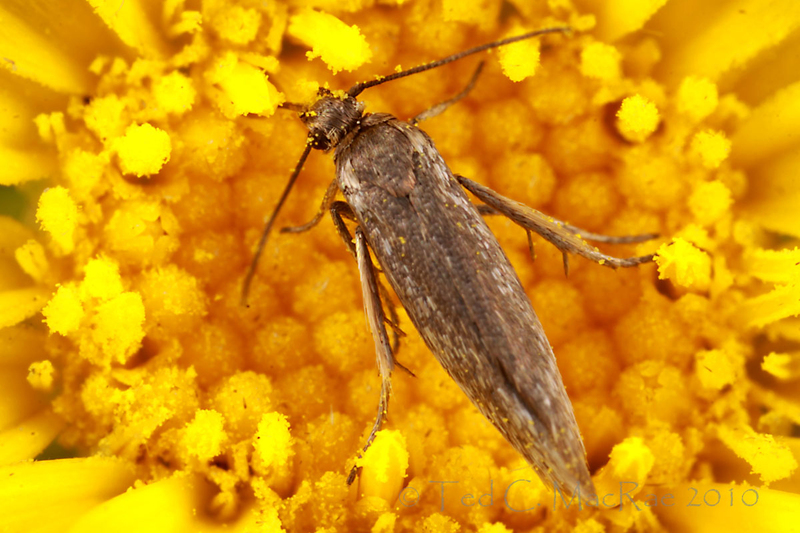 It could be a handful of genera, including Scythris, Neoscythris and Landryia. The latter is a group are are known for strikingly asymmetrical genitalia. 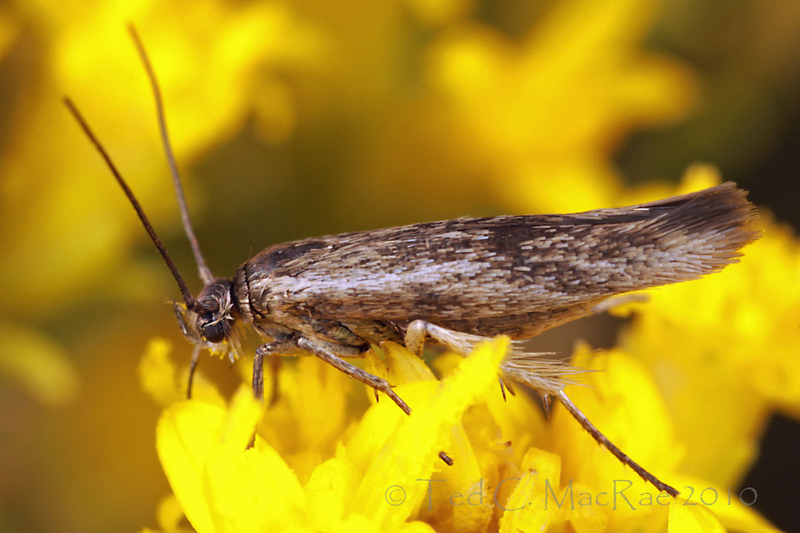 This could be something close to Scythris mixaula, which is abundant in the western states but not known from the great basin (feeds on cactus). @ weirdbuglady – say hi to Wagner! Hi Chris – I figured you’d like this. I wish I could promise more lep photos in the future – unfortunately they tend to become photographic subjects only when the beetle collecting is not so good. Collecting was good this year! The taxonomic situation of these moths sounds not unlike that of so many small beetle groups as well. New species are easy to find, but so often they fall in groups that are in bad need of revision. It just doesn’t make sense to describe them in isolation without fixing the whole group, but few people have the time//resources/tenacity to sit down and do that. It’s hard enough for the professional taxonomists, much less pro-am hacks like me. I do remember you being really intent on getting the right shot of that lep! That just gave me a chance to look a little harder for something else, which in this case ended up being the densely packed multi-colored aphids on sunflower and the nicely positioned Argiope. I’m always amazed at the time we can kill at even the most simple of sites. This makes me think of the hours we spent at the next site, Monroe Canyon, which was one of the highlights of the trip! Hey, Chris – Monroe Canyon will be the subject of the next series of posts. I’ve tried to become less frenetic about getting to as many locals as possible. In the old days I’d only give a spot a certain amount of time to produce – if it didn’t I was outta there! Doing that, however, doesn’t give one time to really look for other things that might never be otherwise noticed. I’ve got plenty of bugs in my collection now – I want to make sure I see the other things that are out there as well.